Brighton and Hove Albion forward Jurgen Locadia was heaped with praise by manager Chris Hughton after this afternoon's 3-1 win at Bournemouth in the FA Cup third round. Dutchman Locadia, a £15m signing from PSV, has had his game time limited since joining the club in January 2018, with only one start in the Premier League before December 22, but he has started the last five games, scoring the winner against Everton and in the 1-1 draw against Arsenal. 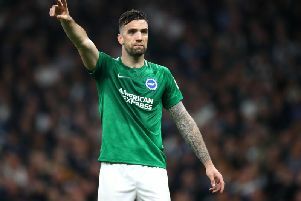 He didn't manage to get his name on the scoresheet against Bournemouth, but was a key part of an impressive performance and Hughton reserved particular praise for the forward post match. He said: "I think he's been a great example for anybody. He's had it difficult since he came here a year ago, injured and out for a short period of time. "We obviously already had Glenn [Murray] in form and [Florin] Andone come in as well. "The system now helps him get into the team now, but right through that period he trained well. He obviously wasn't happy that he hadn't played much football, but he done everything in the right way. "He trained well and I've had lots of conversations with him. If you do that for long enough, then things turn around for you. I'm really pleased for him, he's a really nice lad." Hughton also spoke highly of Yven Bissouma, whose superb 35-yard effort was pivotal in Albion's FA Cup progression. He added: "He's a very talented young player. He's played games in the first team and is very much in there learning and pushing. "He's a bright talent and we just hope we can use that talent to get the best out of him." The Brighton boss was asked about how close the club came to signing Dominic Solanke, who signed for Bournemouth from Liverpool in a £19m move on Friday. "He was a player that was linked with us but that was all I think," he said. "I can't say I don't know the player. He's an exceptionally young, good talent. Any player of that age and quality we are always aware of. It was always just speculation. Bournemouth have got a real exceptional talent and I'm sure he'll do great for them."